The Triumph Street Triple R is everything you could want from a naked bike. Light and agile with incredible brakes and plenty of grunt on tap from the 105bhp, 675cc triple engine, you’ll be grinning from ear to ear the whole time you ride it. The post 2013 version took the basic blueprint of the previous incarnation and refined it into a package that retains the raucous aggression but is easier to live with. The Triumph Street Triple R manages to be both welcoming and manageable for newer riders, but capable enough for those with more experience. To top it all off, it also has one of the best exhaust notes going. "This is a superb bike that has been sold and serviced by ourselves from new. The extras have been fitted since new as well. The bike has all its books and keys and even with such low miles will come with an oil and filter service for its next owner. "The bike is finished in matte grey, has had one owner, and comes with a service history. The bodywork is excellent and the tyre condition is good. It has ABS, Arrow end can (and standard), adjustable levers, bar end mirrors, lower chain guard, fly screen, seat cowl, anodised front and rear brake reservoirs, LED indicators, fork protectors, engine protector kit, frame protectors, Datatag, belly pan, tank pad and quick shifter." 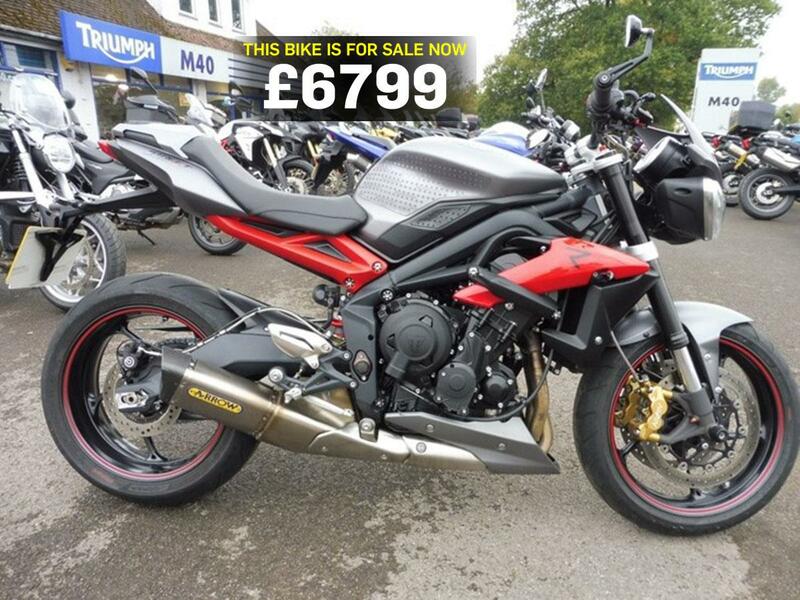 Find a Triumph Street Triple for sale.